Jesse and I just got back from a mini vacation visiting his sweet parents this week. It was a much needed few days of relaxation and I returned home in total Christmas-mode. I don't even know how it happened. I swear I was waving to trick or treaters on my way out of town. But resistance is futile. My Christmas wheels have been set in motion. My inspiration goes into overdrive this time of year, and I'm hoping to share all sorts of fun creations with you over the next month or so. This will be my second Christmas season as a blogger, and I plan to tackle it with both hands. I'll also be sharing the occasional non-holiday-related project, too (like the mantel tutorial I'll be sharing on Monday), so hopefully there will be a little something for everyone. Yesterday, I kicked off my holiday decorating by whipping out my decoupage and creating some snowflake covered books. I have tons of old books that I've collected through the years. I love to read, and although I mostly use my e-reader these days, I still occasionally pick up a pretty book for a dollar or so at the thrift store. I usually try to find books in hues of blue, green, and black. Yesterday, I tried something I've been wanting to try for awhile. I painted my books white. And then I decoupaged some foil baking doilies on them. They turned out so pretty that I'm going to have a really hard time not painting one million more books white. I mean, I'll try to fight it, but let's be rational. I just love the way they look. They make for great holiday decorations, and would also be a really neat handmade gift idea. 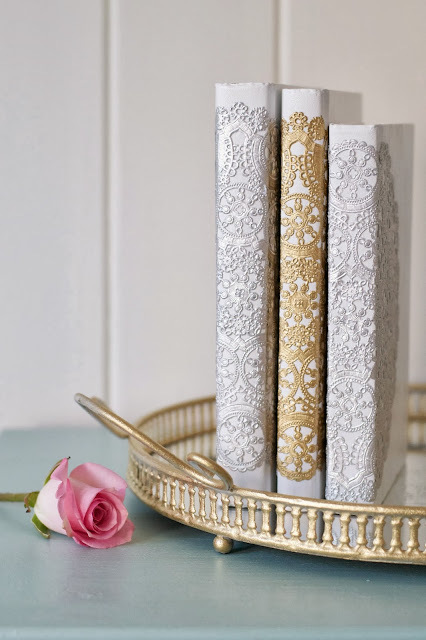 You could paint and decoupage just about any book and write a little message to the recipient inside. Although, for me, that idea is more in theory. I live in a world where my brother gift wraps a plunger. Because that's what my Christmas 2012 looked like. Anyways, they were so easy to make. *All links are affiliate links. The first thing I did was paint all of the books. I coated them with a coat of primer first (so that the paint would stick to the glossy covers) and then coated them with two coats of white paint. 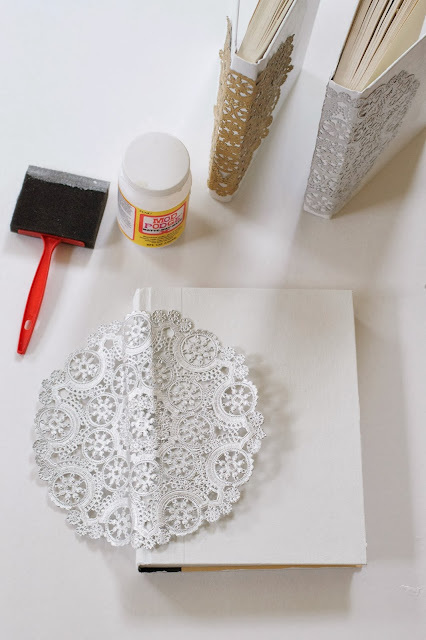 Once the paint was dry, I attached the foil doilies with Mod Podge, pushing the doilies into the crevices of the binding. 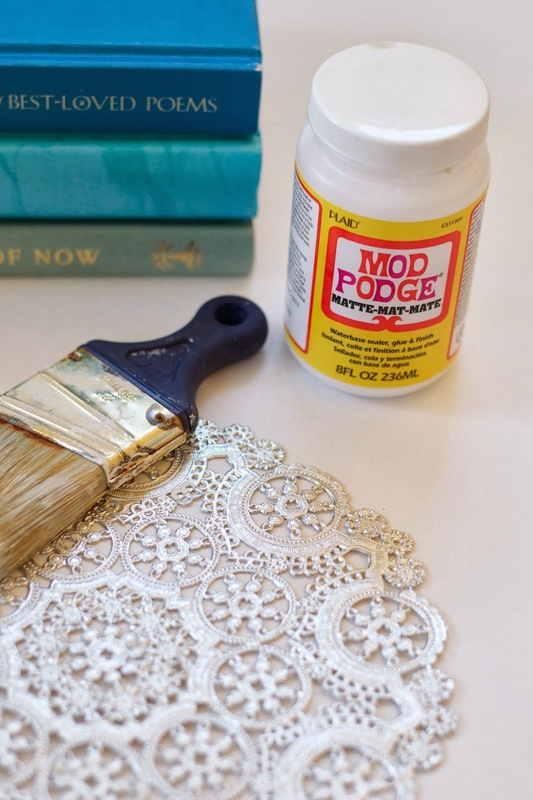 Once the initial layer was dry, I put one coat of Mod Podge over the top of the doilies to seal them. Once they were dry, I was free to run about my house, trying them out in all sorts of different locations. They seriously looked great just about everywhere. My new green & gold ornament wreath. My favorite Christmas project ever. The thrift store trip that changed everything. Hopefully I can make this happen again. I love the Dollar Store. The project that I will NEVER do again. I love my blog readers, and this is why. That one time I made Jesse wear a teddy bear vest. Thanks for stopping by! I appreciate ya'll so much! I love this little DIY project. So feminine and festive! These are so cute! And I love your collection of blue, green, and black books! I covered some of my music books in white homemade book covers. That way if/when I want to have the original covers I just need to remove them. I just used two sheets of typing paper. 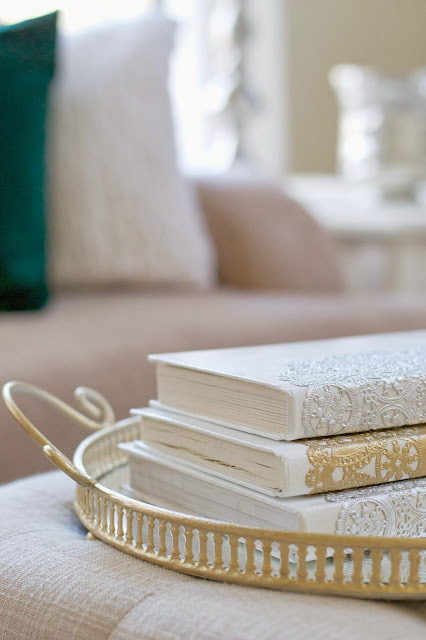 Worked like a charm and then they coordinated with my decor :-) But I LOVE the idea of just painting old books and OH yours look fabulous with those foil doilies. Great idea! Oh these are lovely...you do tempt me! Oh too cute!!! You have the best ideas. 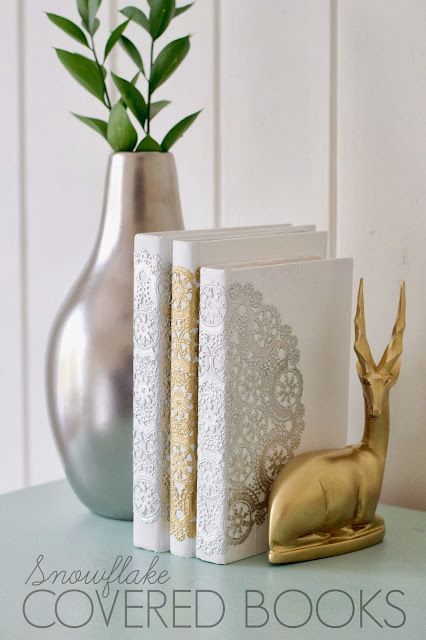 You know they would also be so pretty for a hand made guest book at a wedding, or you could do them pink or blue for a baby book gift...or a journal--- the possibilities are endless!! 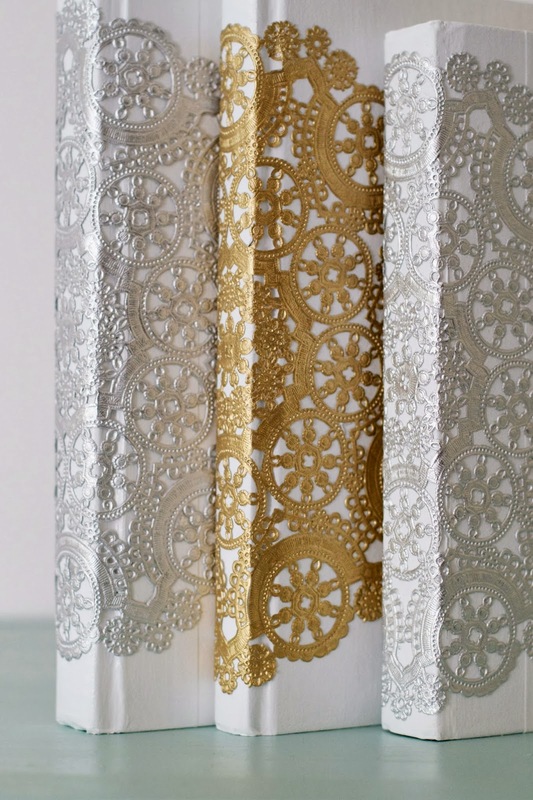 What do you mean by foil baking doilies? I always have different sizes of paper doilies that I line a plate or tray with for special occassions..I have some old books or can buy them cheap..do you spray paint the books first before using modpodge? 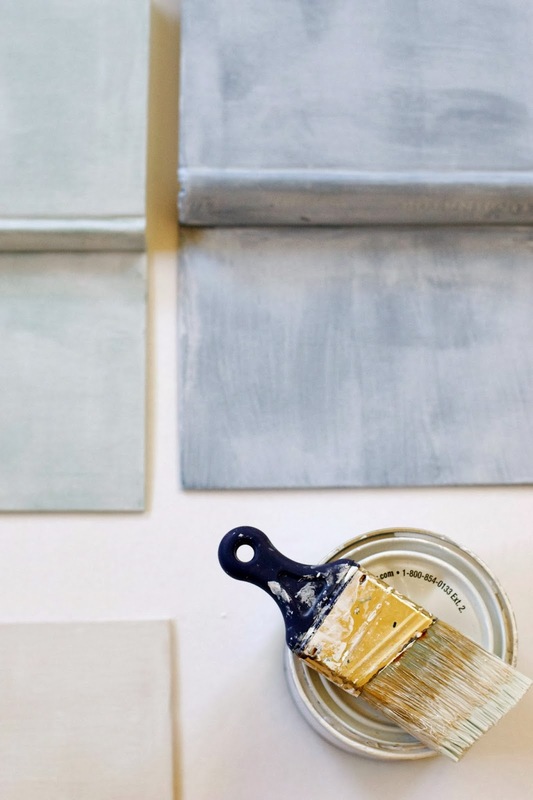 How do you paint the books without painting the pages? Silly question but I've never done any such projects but those you show are beautiful! Looks beautiful! 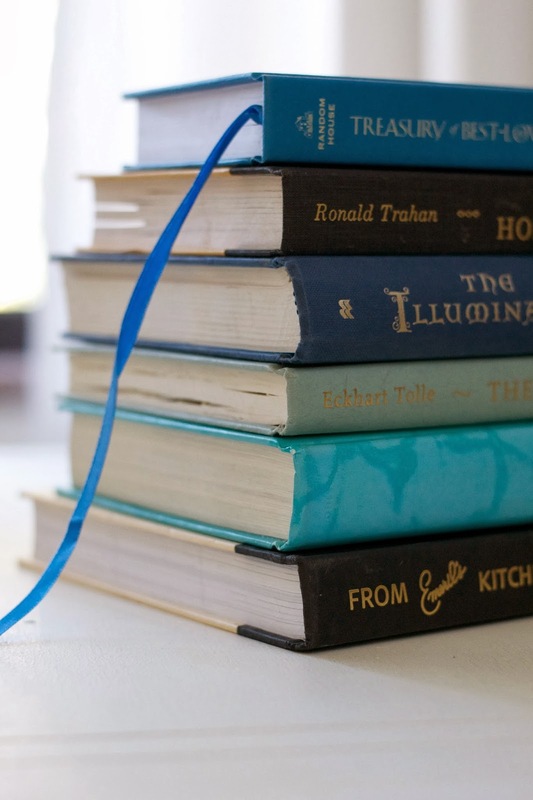 You could also use freezer wrap to cover the books. 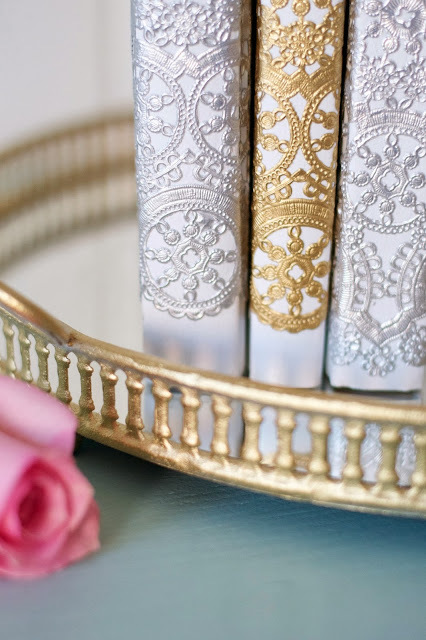 Virginia, I love the books that are covered in what you refer to as foil paper doilies. They are beautiful! 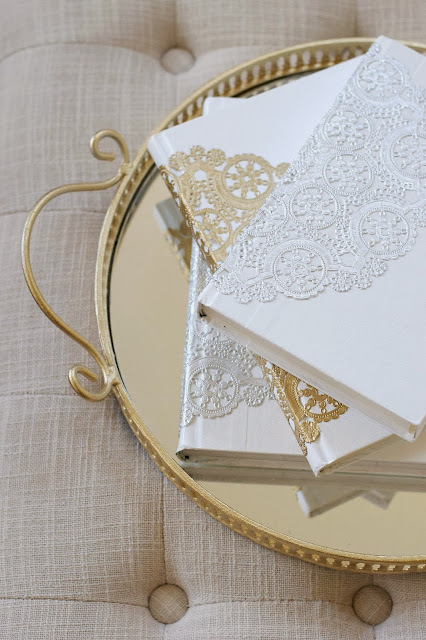 I buy the paper doilies that come in a pack to line my trays or a nice glass/china dish for a pretty presentation of baked goods. Is this what you are talking about? I usually buy these paper doilies in grocery store..do I need to go to party goods store for the "foil" dolies? Pretty! I wonder, where do you get most of your ideas or inspiration?